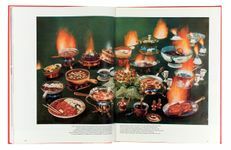 On November 10th at the Shakespeare and Company café in Paris, Susan Bright (author of Feast for the Eyes), Denise Wolff (editor of Feast for the Eyes) and Matthieu Nicol (a cookbook collector) will gather for an event around the photographs that appear in cookbooks. 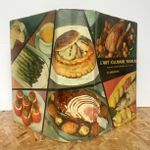 This event will follow the classic show-and-tell model and introduce books that influenced the conception of Feast for the Eyes as well as other stunning examples from France and America. 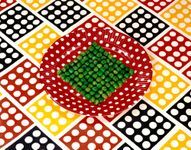 The photographs that appear in cookbooks are rarely just about food. They are rich documents that illustrate the lives and times in which they were published. They raise questions which cut to the core of the most human of activities—that of preparing food and feeding others and ourselves. Eating is the most visceral of acts, but it is also caught up in a host of rich associations such as ritual and religion, to name but a few. 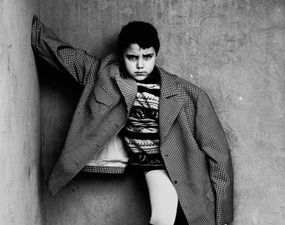 The photographs in these books show us a lifestyle we aspire to, but at the same time, they are also the building blocks of culture itself. 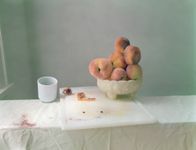 Some of the photographs that will be on view at the event are drawn from cookbooks in Matthieu Nicol’s collection. These resonate beyond mere subject matter, often obliquely commenting upon French culture and nationhood (and in the case of one example, the culture of East Germany). They are books that are rich in symbolism and connotations and often trade in stereotypes and assumptions. They are carriers for all kinds of fantasies, from the suburban to the most bourgeois. 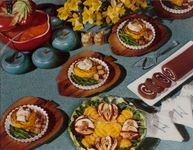 Another slice of images comes from Susan Bright’s book Feast for the Eyes, which shows how art and more vernacular photography featuring food are no less concerned with showing us how we live and how we value ourselves. The earliest examples of food photography initially took their cue from painting. 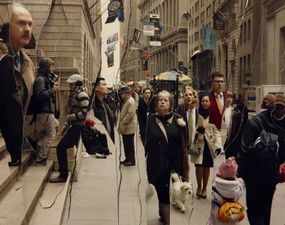 This new genre quickly developed its own vision and set of aesthetics, however, often seesawing between commercial and artistic influences. Finally, Denise Wolff concentrates on American examples ranging across very different moments and audiences of American life and lifestyle. Designed for use in the kitchen as well as display on the coffee table, the books featured here lean heavily on ideas of archetype and fantasy. Some of them are very local and specific, appealing to the quintessential housewife, while some appeal more to armchair travelers. 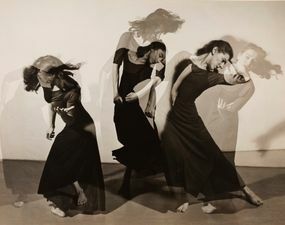 What ties them together is their extraordinary use of photography. Photographs of food—whether designed for the kitchen shelf or art gallery wall—connect us to our dreams and desires in a way that suggests a lifestyle which taps into our most latent desires. 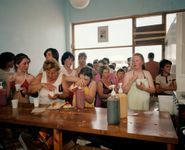 These photographs can reinforce stereotypes or undermine them and signify anxieties and questions about ourselves. So in retrospect, what may seem funny and strange to contemporary eyes was often vital and modern at the moment of its creation. It’s easy to laugh—but just think how ridiculous our obsession with avocado on toast will look in twenty years. 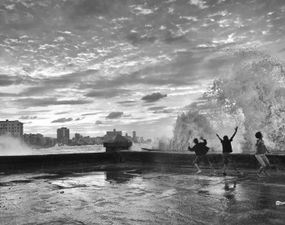 Editors’ note: “Feast for the Eyes” is published by Aperture. This event will take place at 10 AM on November 10 at the Shakespeare and Company café. It is part of Photobook Week. The gathering is organized by Too Many Pictures, of which Matthieu Nicol is the founder and director. 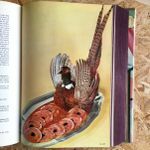 Discover more of Nicol’s cookbook collection via his curious and delightful Instagram feed. 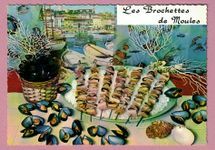 Les Brochettes de Moules (Mussel Skewers). Editions Lyna, Paris, 1963/64. This is one good example of the recipe postcards published by Editions Lyna. This one shows recipe number 106, by Emilie Bernard, illustrated with a picture by Michel Appolot, a photographer based in Grasse. These postcards were published by the millions and are still easy to find nowadays in flea markets and garage sales. They use the "Italcolor" process which was supposed to guarantee natural colors. Choucroute Garnie. In "Menus et recettes des provinces françaises." SOPEXA, 1980. 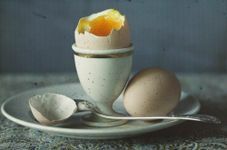 This photograph illustrates a recipe in a cookbook that is a communications tool edited by a marketing agency and aimed at promoting the French food industry and local specialities. It is divided in 17 chapters, one for each region of France. 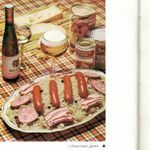 This nice cookbook full of recipes invites you to just open tin cans and pour yourself glasses of French beer or wine—all produced by French food-processing companies. From "L'Art Culinaire Francais. Par nos grands maîtres de la cuisine." Flammarion France, 1957. 3760 recipes and pieces of advice. 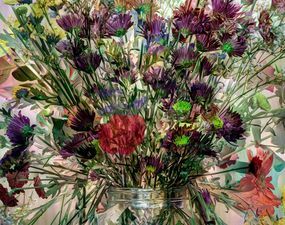 280 illustrations in black and white, 420 subjects in color. 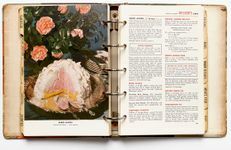 This massive cookbook from the 1950’s is one of the first that was not meant to be kept in the kitchens, but designed as a living-room book. 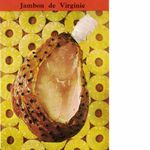 It is a real encyclopedia describing the excellence of French Gastronomy. It was put together by renowned chefs. 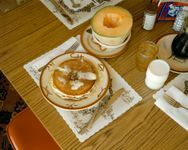 Most of the recipes are virtually impossible to execute in a regular home kitchen since they are so elaborate. From "L'Art Culinaire Francais. Par nos grands maîtres de la cuisine." Flammarion France, 1957. From "Betty Crocker’s Picture Cookbook." General Mills Company, McGraw-Hill: New York, 1954 edition. 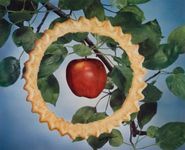 Though the 1950s, "Betty Crocker Picture Cookbook" was well-known. Today, it’s a pleasure to revisit. Decadent color photos burst at the seams with American bounty. Buffet-style spreads are in full force and meant to feed an army of guests: epic picnics and breakfast feasts, rows of frosted cakes and jellyrolls, and salads galore. They are more exuberant than they are appetizing, speaking more to tastefulness (or perhaps the lack thereof) than taste itself. In these pictures, America presents itself as plentiful during the Cold War, in direct contrast to communism. Despite all the messaging, the book remained a functional cookbook. The tables and counters full of food are aspirational, but still seem achievable. "Time Life Picture Cookbook." Time Inc: New York, 1958. The pictures here are spectacular in the truest sense of the word. 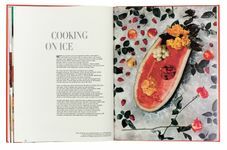 The watermelon on ice with roses is a gorgeous still life that holds up today; the “Drinks and Hors D’oeuvres” opener could pass as an Irving Penn (it’s by H. I. Williams). 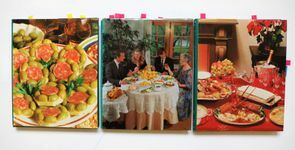 The book still operates within lifestyle and taste, but is something you would more likely display in your home rather than actually use, making the publication more a photobook than recipe book. 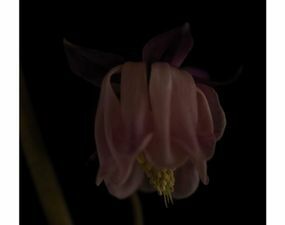 Dark, moody and sensual still life photographs of flowers in wintertime.